The Nevada National Security Site and its related facilities help ensure the security of the United States and its allies by: supporting the stewardship of the nation’s nuclear deterrent; providing nuclear and radiological emergency response capabilities and training; contributing to key nonproliferation and arms control initiatives; executing national-level experiments in support of the National Laboratories; working with national security customers and other federal agencies on important national security activities; and providing long-term environmental stewardship of the NNSS’s Cold War legacy. Located in a remote, highly secure area of southern Nevada, the NNSS is a premier outdoor, indoor, and underground national laboratory. It is a preferred location for experiments supporting the National Nuclear Security Administration (NNSA)’s nuclear weapons Stockpile Stewardship Programs, national defense programs, and national security research, development and training programs, as well as vital programs of other federal agencies. 3) Environmental Management, which includes environmental protection, compliance, and monitoring of the air, land, water, plants, animals, and cultural resources at the NNSS; investigation and implementation of appropriate, cost-effective corrective actions to address legacy contamination from historic nuclear weapons testing at the site; and permanent disposal of low-level and mixed low-level radioactive waste generated by environmental clean-up activities at the NNSS and other sites across the nuclear weapons complex. 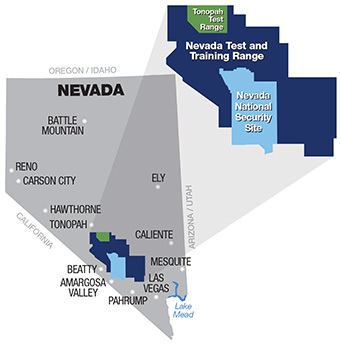 Larger than the state of Rhode Island, the 1,360-square-mile Nevada National Security Site is located 65 miles northwest of Las Vegas. The contractor-operated site is overseen by the NNSA’s Nevada Field Office. Satellite offices are maintained in Los Alamos and Albuquerque, New Mexico; Santa Barbara and Livermore, California; Long Island, New York; and Washington, D.C. The scientists, engineers, mathematicians, and technicians at the NNSS and its satellite locations partner with colleagues from across the National Security Enterprise, including the national laboratories and the defense and intelligence communities, to execute a multitude of high-level experimental, research, and training activities in support of national security. Cancellation Policy: All cancellations must be received in writing by September 1, 2020 and sent to NWRA via fax to 775-473-5473, mailed to P.O. Box 8064, Reno, NV 89507, or emailed to nevadawaterresources@gmail.com. Cancellations received after September 1, 2020 will not be refunded. All other cancellation requests will receive a refund minus a 25% administrative fee. If you have purchased the registration with a credit card, the convenience fee is non-refundable.